Marlborough is a small town and locality in the Shire of Livingstone, Queensland, Australia. At the 2006 census, Marlborough and the surrounding area had a population of 355. 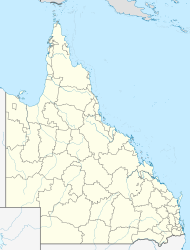 The town lies on the Bruce Highway, 106 kilometres (66 mi) north west of the city of Rockhampton. It is within the local government area of Shire of Livingstone, but, between 2008 and 2013, it was within the Rockhampton Region. The town is a small service centre for the surrounding area, and one of a number of fuelling points on an otherwise isolated stretch of highway. To the south lies the Kunwarara Magnesite mine, which works one of the world's largest supplies of the mineral. Marlborough is famous for producing the world's finest chrysoprase, a semi-precious gem once coveted by Alexander the Great and Cleopatra. The small but high-grade deposit is located about 20 kilometres (12 mi) south-south-west of the township and is universally regarded as the most valuable find in the world. The town was first established in 1856. Its name was derived from the Parish name, which came from a pastoral run name first used for the area in 1861. There is no record of its origin, but it is probably connected with the First Duke of Marlborough (1650-1722), a British army commander. The post office at Marlborough opened on 1 January 1861. In 1993, the Principality of Marlborough was established as a short-lived micronation located at 22°30′18.19″S 149°9′6.45″E﻿ / ﻿22.5050528°S 149.1517917°E﻿ / -22.5050528; 149.1517917 near Marlborough. The principality came into being when farmer George Muirhead, facing the possibility of the repossession of his properties - Kierawonga & Indicus - by the Commonwealth Bank, challenged the legality of their bills of exchange in the Queensland Supreme Court. When he lost the case, Muirhead returned to his property under the grounds that he had been denied natural justice, and, along with his wife and approximately 30 other supporters, declared it to be an independent principality where the bank and Queensland Government had no legal authority. Marlborough State School has only a few students. It opened in July 1917. They compete against different schools in the area such as Clarke Creek State School, Milman State School  and School of Distance Education. They compete in swimming and athletic carnivals which they normally host, having a 16-metre pool and a grassy oval. Livingstone Shire Council runs a weekly library service at Marlborough. It is located at 15 Milman Street in the Marlborough Historical Museum building. ^ a b Australian Bureau of Statistics (25 October 2007). "Marlborough (Livingstone Shire) (State Suburb)". 2006 Census QuickStats. Retrieved 5 July 2008. ^ a b "Marlborough - town (entry 21019)". Queensland Place Names. Queensland Government. Retrieved 20 June 2017. ^ "Marlborough - locality (entry 48747)". Queensland Place Names. Queensland Government. Retrieved 20 June 2017. ^ Milliken, Robert (10 June 1993). "Outback 'duke' takes on the bank: A Queensland man has defied Australia by creating a principality to escape his debts". The Independent. Archived from the original on 20 June 2017. Retrieved 20 June 2017. ^ "Marlborough State School". 16 January 2018. ^ "Livingstone Shire Council Library Services". 16 January 2018. ^ "Marlborough Historical Museum". 16 January 2018. This page was last edited on 18 April 2019, at 23:25 (UTC).